The start of this journey includes smarter context-aware auto-completion as well as a host of code navigation features such as an outline view, go to definition, find all references as well as other useful functions such as hover-to-reveal information, errors and warnings (diagnostics) and document formatting. We strongly recommended you use Atom Beta 1.21 as it includes the necessary file monitoring and process control to ensure the underlying language servers are running properly. Our good friends over at Facebook have published ide-flowtype to bring the power of the Flow type annotation system to Atom. One of the earliest examples of a language server was OmniSharp for the C# language. By taking advantage of the node-omnisharp package we are able to bring many IDE-like features into Atom for C# via ide-csharp. The Eclipse foundation and Red Hat have been a big proponent of language servers and the Java package shows! You will need a Java 8 runtime installed to get going but then can enjoy much richer editor facilities. Check out ide-java. Autocomplete is enabled in all the ide packages we are shipping today. Start typing to get improved results. Some providers may require you to manually trigger autocompletion by pressing CtrlSpace for performance reasons. You can see diagnostics by clicking the red exclamation mark and yellow warning triangle at the bottom left of your Atom window. This will open the new Diagnostics pane that shows you the errors and warnings and allow you to click them to jump right to that location in the code. You will also see indicators to the left of line numbers in the editor itself. Position the text cursor in the class or variable you are interested in then activate Find all references either from the right-mouse button menu or Find References: Activate from the command palette. Some providers allow you to reformat the document. Simply select Code Format: Format Code from the command palette. Ctrl click on a class or variable reference to be taken directly to where it is defined within your project. Hover the mouse pointer over a type or other supported object and you can see some additional information relating to it. Many providers let you see a tree-based outline view of the current document which you can search and then click to go right to that area of code. You can toggle the new Outline View from the View menu or the Outline View: Toggle command. Some providers let you see immediate references to the variable or object you are working on. Positioning your text cursor within that variable can highlight other references instantly. This is just the start of our journey. 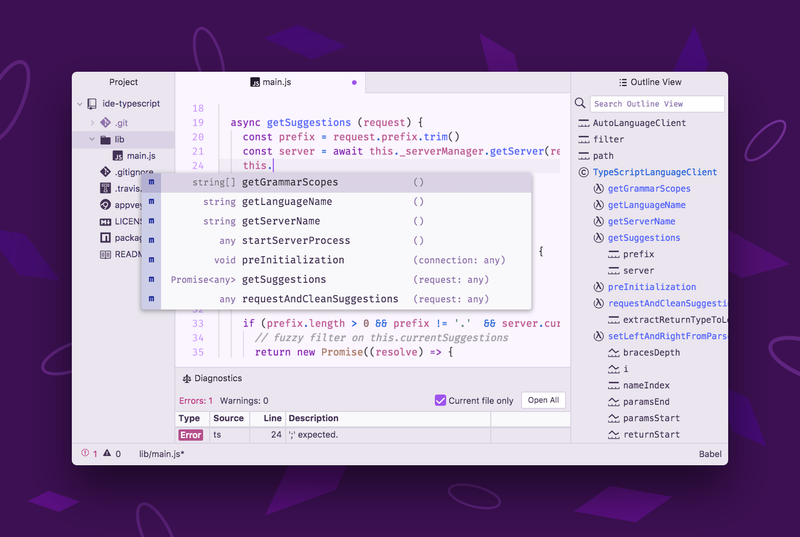 With the help of our community, we plan to expand the number of languages that Atom-IDE can support and make it possible for you to run and edit applications, making Atom-IDE a true IDE. We hope to see future language support for the great languages out there including Rust, Go, Python, etc. If a language server exists for your favorite language it is incredibly easy to create your own Atom-IDE package that takes advantage of it by using our atom-languageclient npm library that provides common automatic wire-up of the major features as well as helper tools such as downloading support files and conversions.